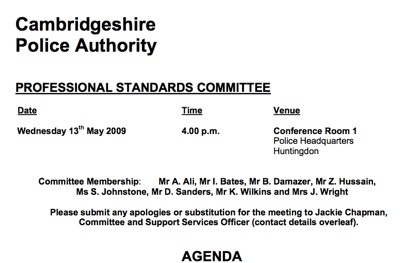 I observed Cambridgeshire Police Authority’s Professional Standards Committee on the 13th of May 2009 and watched Independent Police Complaints Commission (IPCC) commissioner Len Jackson contribute to the committee’s discussions. 89% of complaints against the police are deemed “unsubstantiated”. According to the IPCC commissioner this is so high because the system is flawed and needs reform. The police complaints system is currently unable to deal with complaints for which one individual officer cannot be held responsible. The IPCC is financially stretched, to such a point it is unable to fulfill its role. One of Mr Jackson’s fellow commissioners, John Crawley, resigned from the IPCC due to the organisation’s ineffectiveness. Mr Jackson started by saying that now the IPCC is no longer “new” it is not getting preferential treatment from central government with respect to its funding (it was established in 2004). He said it was now “in the pot” with everyone else. Funding issues had been compounded by the G20 investigations which had resulted in investigators from all IPCC regions being sent to London. He noted this was very expensive and central government were putting up extra funds to cover hotel and food costs for those individuals. This had resulted in a situation in Cambridgeshire and other regions where the “number of live investigations exceeds the organisation’s capacity”, even if given the extra funding the organisation required he warned it would take time to train up new staff. He said that even those complaints which “engage article 2″ (Article 2 of the European Convention on Human Rights – The Right to Life) were not being investigated by the IPCC directly, but were having to be conducted by another force or run as “managed investigations” rather than independent investigations by the IPCC. Mr Jackson described the current situation where once again we have police forces spending time and resources investigating each other a “retrograde step”. An interesting section of Mr Jackson’s presentation referred to the IPCC’s role in monitoring (and shaping?) police policy. He appeared to me to be suggesting that in some areas the IPCC ought take a greater role in developing policy on things like Firearms, Custody, Mental Health, and Police Communications. He noted the recent work the IPCC had done in the area of mental health, and suggested that the IPCC could do more of that kind of research and policy development work. Mr Jackson referred to the Association of Chief Police Officers (ACPO) [A secretive private company, not subject to the Freedom of Information Act] which currently produces national policy on such areas and said “there are things we can get to ACPO can’t”. He didn’t expand his reasoning further, but reported that the IPCC were planning to stop focusing on the smaller policy portfolios and concentrate on those major areas I have listed. I think the IPCC ought to have input into policy development, though that is an aside with respect the primary current problem of a lack of openness and transparency with respect to ACPO. With respect to the region he said that up until ten days ago (3rd May 2009) it was “very calm”, but said there had been a couple of serious cases in the last week / ten days one in Hertfordshire (presumably the death of Jason Hearn and one in Cambridgeshire. He said the Cambridgeshire case was being passed back to the force to investigate and noted the IPCC’s regional response and decision making times were increasing. Members of the Police Authority asked who pays in the case of one force investigating another or in the case of a managed investigation. They said they understood it was the IPCC in any-case so that didn’t help the IPCC’s financial position. Mr Jackson confirmed this was the case at the moment, but implied he was expecting things to change as he said: “This Home Office is dragging its heals in this area, we want to see what happens” he added “Ministers might fund an independent investigation on an ad-hoc basis as happened with G20″. I think this is a worrying state of affairs as it allows political considerations to come into play before a decision to investigate or not is made. If we are going to have an Independent Police Complaints Commission we need to allow it to operate independently. Mr Jackson, speaking slightly later in the meeting spoke of a problem with the current complaints system which can result in a complaint from a member of the public being considered “valid” but as no individual officer can be identified as culpable it cannot be “upheld”. This he said underlay the fact that 89% of complaints were not upheld (found “unsubstantiated” is the word used by the IPCC 07/08 statistics). Mr Jackson pointed out members of the public who complained, with valid reasons, only to have their complaint determined to be “unsubstantiated” because of the way the system requires a individual officer to be culpable resulted in complaints not being satisfied with the outcome. I believe this change, if made, will allow complaints about systemic problems, such as the police’s harassment of photographers, to be dealt with. In Cambridgeshire the police it might result in officers being required to follow the PACE Codes. The involvement of IPCC representatives in the meeting was not mentioned on the agenda. I am meeting the Chief Executive of the Police Authority on the 8th of June 2009 to discuss openness and transparency within the authority and will suggest that in future IPCC involvement ought be reflected in the published meeting papers. This entry was tagged ACPO, Cambridge, Openness, Police, Police Authority, Transparancy on May 26, 2009 by Richard Taylor. So, there are 9 out of 10 cases where the complainant says something along the lines of, “Well, the copper hit me over the head, but I didn’t get his number.”? Or does ‘unsubstantiated’ cover cases where it is simply the word of the police officer against the complainant? It’s flawed and a completely biased system. I have a complaint about a policeman in plain clothes not showing his Id card when it was asked. The IPCC have swallowed the police idea that if you show your ID card after 20 minutes you have met the law. The law is clear, its that the “id card must be shown on demand”. The police have omitted the on demand part, editing the law, and because the IPCC refuse to enter into dialog with me, and will only talk to the police, they fall for it. Similary when it comes to missing CCTV tapes, they just choose to ignore that part. We might ask why this serious issue is not being much researched or discussed in the press. Most people who have a complaint don’t complain. In terms of local policing our forces in the UK are useless and in terms of more national issues look too aggressive, biased and idiot-laden. Most find the IPCC even worse than the cops in covering-up. The whole shebang needs to be disestablished to allow real complaint and move policing to the areas we want. Its not just the problem where no individual officer can be identified that makes the IPCC ineffective as a custodiam of civil rights. I mustrust Len Jackson’s appetite to influence policy and counter balance IT lobby firms like APCO, who have seen to many RoboCop films. SO why doesn’t he speak out in public and advise them to ‘consider’ the bad example the Police is setting by continuing to break human rights and data protection principles? My guess is, he is too busy institutionalising the extraordinary powers the police already have amassed under anti terror legislation and doesn’t want to rock the boat. For a period of four years I have been fighting to get the North Yorkshire Police to investigate my allegation of corruption against Police Officers. The I.P.C.C. are totally not interested. The Police Authority are not interested. If I cannot get an enquiry as a retired Police Officer,then what chance has a member of the public. If the Chief Constable does not wish an enquiry then there is absolutely nothing the IPCC can and will do. Neither will give any answer to my direct questions. These people are totally alien to the rights of justice. The IPCC are so biased towards the police it is unbelieveable.They have a very poor reputation for being unhelpful for members of the public and this is fully justified. They have absolutelly no intention of providing any assistance for the public at all, and their whole complaints system is set up completelly in favor of the police force and defending police officers rather than helping the complainant! They are known to turn a blind eye to police misconduct and must work very closely with every forces “Professional Standards dept” to gloss over any misconduct and acts of incompetence. The IPCC are very ineffective, biased and have no function other than defend and protect police officers. Does anyone know if he can do this,where is his accountability,and proportinality,do I not have rights,does my dying father not have the right to be protected,what is a Safer Neighbourhood Team being paid high wages for if they wont help.